Bagger motorcycle riders are rolling up the miles on the Cross Roads Classic® from Victory Motorcycles. It has convenient storage space, comfortable seating for one or two. Enjoy solo riding or ride 2-up on the roomy, stylish Cross Roads Classic seat. It’s comfortable enough for you to ride all day and leave the pack behind. Add Lock & Ride® accessory backrests for custom style and extra support. 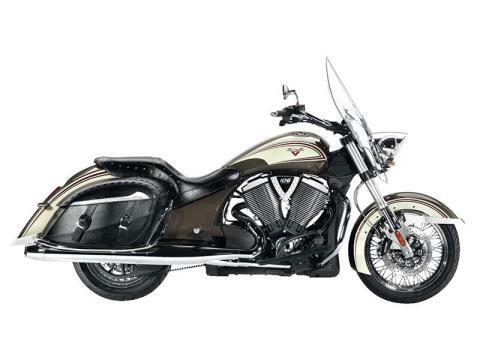 The Victory Cross Roads Classic rear suspension keeps the ride smooth. It provides 4.7 in. of travel, and its air shock is easily adjusted using a hand pump for a consistently smooth ride. Ride solo or 2-up, with or without cargo, and the rear suspension will keep it smooth. A stylish chrome light bar is standard on the Cross Roads Classic, and it provides valuable auxiliary lighting as well as classic bagger style. The windshield offers wind and weather protection to keep riders fresher during great days on the open road. It’s the intersection of classic style and modern performance technology. The Victory Cross Roads Classic has a stunning Two-Tone Bronze Mist & Khaki paint scheme on all the bodywork – front and rear fenders, fuel tank and side covers. There’s classic style from fender tip to fender tip. Your Victory Cross Roads Classic has style and performance. The Victory® Freedom® 106/6 V-Twin is a 106-ci engine that delivers 106 ft. lbs. of torque. It’s a smooth, efficient engine – counter-balanced and fuel-injected. The 6th gear overdrive of the Victory 6-speed transmission drops the RPMs and delivers the smooth ride you’re looking for. Your Victory Cross Roads Classic belongs on the street, not by a gas pump. The 5.8 gal. fuel tank gives you outstanding range so you can rule the streets and enjoy long stretches on the open road between fill-ups. The seats and saddlebags are trimmed with metal studs for a classic American motorcycle look. The stylish saddlebags are also ultra-functional, providing 17.4 gallons of convenient storage space. The lids extend over the bag openings to protect cargo and the lids buckle securely shut.